British chef Gordon Ramsay has created a new range of sources to provide a sauce of funds for Comic Relief … sorry, let’s try that again. 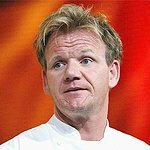 British chef Gordon Ramsay has created a new range of sauces to provide a source of funds for Comic Relief. At least 10p from the sale of every jar of Seriously Good sauces will fund Comic Relief charity projects in the UK and around the world. Available in five flavors – including Bolognese & Red Wine and Spicy Red Pepper & Spianata Sausage – the sauces have taken three years for the chef and his team to develop. The sauces will be sold all year round in supermarkets, with a recommended retail price of £1.89.